As a result of the simplicity of attitude inherited from the earlier birth, the soul in the womb of the queen had a soothing and pacifying influence on the outer world. The people of the kingdom were suddenly filled with the feelings of humility and fraternity. Irrespective of age, caste, creed and status every one started greeting and honoring others. Politeness and polished manners became the thing in vogue. The augurs and other scholars confirmed taht as the aura of a pious soul influences all the people around, the effusion of politeness was caused by the soul in the womb. As the influence of this soul was evident in the overt mutual greetings, the king named his son as Abhinandan (greeting). 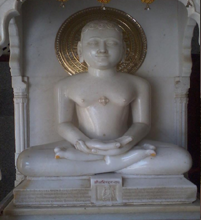 Shri Digamber Jain Teerth Kshetra, Ayodhya, U.P.